Quick update: I’ve come down with a cold (ugh, worst timing) and also I had waaay overestimated how quickly we’d be able to unpack. We need to buy some more storage for the main bathroom and buy a wardrobe system for the bedroom so we have somewhere to put our clothes. Sorry about the crappy photos, but we’d been unpacking for several hours before it occurred to me to take some photos for posterity. 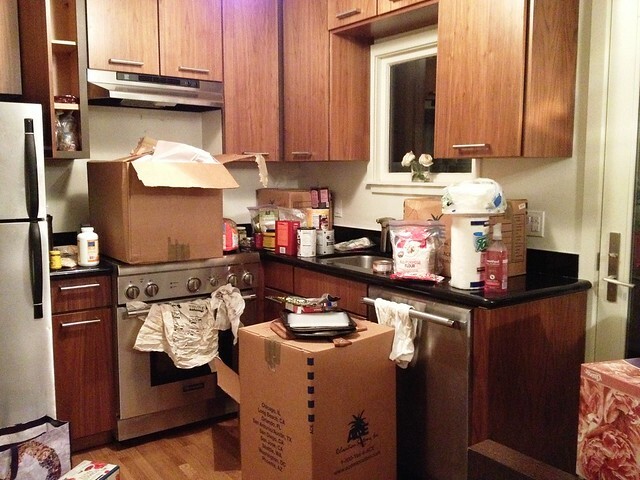 Note the mountain of empty boxes in the corner. 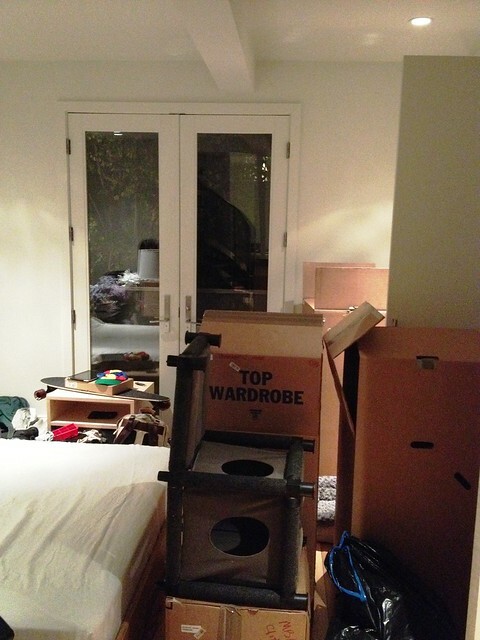 The bedroom looks surprisingly OK but what you can’t see is that all three wardrobes are also full of boxes. The TV room and second bathroom are both pretty neat but the main bathroom has toiletries everywhere because whoever designed it apparently decided that no storage was necessary. I miss Seattle and our friends. I spent the first week in San Francisco intensely homesick. That didn’t happen when we left Melbourne, which is strange because Melbourne to Seattle is a way bigger move and we were leaving close friends and family for a whole other freaking country. I don’t know why it hit me so hard this time. I actually try not to think about Seattle because then I start crying and I can’t stop. I’m sure that eventually I’ll get used to it, but right now I’m pretty upset at the prospect of spending almost double to live in a city I don’t love as much and having to make friends all over again. I don’t want new friends – I want our friends. =( So yeah, James feels awful because he felt like he’d pressured me into moving here (which he totally didn’t) and I feel horrible for ruining what should be a really exciting time for him. James always tells me that my one job is to be happy. He’s always given me anything I’ve wanted and I can’t even manage to do this for him. I haven’t found a replacement gym either (which I’m sure isn’t helping). I should probably start doing some bodyweight exercises so I don’t waste away into nothing. I bet I can’t even do pull-ups anymore. James loves his new job. He said he gets to use really innovative technologies an the projects he’s working on are even more interesting than they had led him to expect. He really enjoyed his time at Amazon, but he said Google is on a whole other level. I can see how much happier he is working on something that he’s passionate about – the famous (and in no way exaggerated) Google perks are just the icing on the cake. James said that if I still hate San Francisco after 18 months he will transfer to the Seattle office. He said that my happiness is his number one priority, but his happiness is my number one priority! I really hope that I can learn to appreciate it here – I know that Seattle didn’t feel “right” to me until we moved out of corporate housing so maybe that’s the case here. We have two more months of free housing and I don’t want to give up the ability to save all that extra money even if it means being occasionally homesick and mopey. Even more sadly we will be leaving Seattle. I can’t tell you how much I love it – the weather is perfect, it’s close to beautiful hikes and amazing snowboarding, and we’ve made such wonderful friends. Honestly I feel like I could have lived the rest of my life here. I don’t even get hayfever which is freaking astounding. So why would we leave? Because James has accepted a job offer in California! He’ll be working for Google in an area he’s passionate about, so I’m absolutely thrilled for him. It wasn’t something he’d planned in advance (as our SEA-LAX-MEL flights, my half-used CSA subscription and completely un-used 2014-15 season’s pass will attest to) but once the ball started rolling everything moved pretty fast. We just came back from a location scouting trip in the Bay Area and later this week we’re heading to Mexico to get our visas sorted. 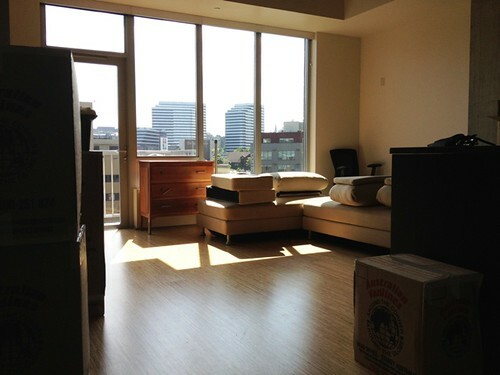 Then at the end of the month we’re moving into corporate housing in San Francisco! These next few weeks will be pretty hectic. I’m super sad at leaving all our friends and this beautiful city but happy that James will be working at his dream job. So yeah, HappySad. Our sea shipment has arrived. There are boxes lined up all along the left and right walls that you can’t really see so it’s slightly more significant than it appears. The Graebel guys were really great – they did all the unpacking in the corridor so none of the foamy stuff was brought inside. They would have unpacked all the cardboard boxes for us too (apparently it was included in the package) but it seemed unnecessary, especially since we didn’t really remember what we had packed and had no idea where it would go. I was a little worried that the couch would be too matchy-matchy with the wooden floor but it’s significantly lighter which is good. I had actually remembered the couch as being smaller and now I’m worried it will be a tight squeeze with the table that I want (not the CB2 Dylan anymore). I’m waiting for James to get home tonight so we can move the couch around in different configurations to see what works. It looks like the couch will have to be quite close to the TV which may mean that James will have to settle for the 46″ instead of the 50″. In the meantime I’m washing the clothes that came in the sea shipment (we’ll be able to wear different stuff now!) and putting random things away. 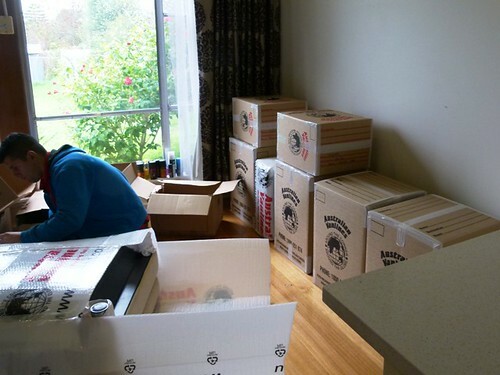 It has been a few hours since I took the photo above and the room looks largely the same but with more open boxes. There is some damage to the chest of drawers (not the handle pulls, they were already stuffed, but there was this decorative wooden bit on top that was removed. Otherwise everything seems to have made it through safely – although *knock on wood* I haven’t opened all the boxes yet. I ordered the bed today, which will arrive on the same day as the mattress. Then once the credit card has been paid off I’ll order the chairs, pay off the credit card, then the dining table, and pay that off (we have a ridiculously low limit on the credit card and the bank won’t let us pay off the card in advance). Then the TV will be the only big thing left to get, plus some odds and ends like extra storage bins. Well after many hours chasing up Australia Post and the US Consulate trying to figure out where his passport and visa were, James let Amazon know that he wouldn’t be able to make it for the initial start date. Australia Post had sent James an email to let him know that his passport/visa were officially lost and they were no longer going to search for it, so James paid like $600 to get a new emergency passport. He let Amazon know about the new ETA and one of the lawyers or relocation got in contact with someone on the US end, who contacted Australia Post and that day Australia Post sent James a notice to let him know that they had found his passport. =/ So I’m not sure if they just pretended to look when James originally put in the enquiry or what, but we were very unimpressed. At least James can still use the visa inside his old passport. So we’re finally at the packing stage. 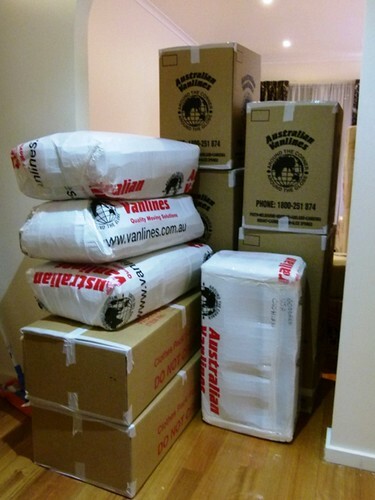 We moved everything to the living room and sorted the sea shipment to one side and the air shipment to the other. We were told not to pack anything, and one of the movers said that we actually did more than was necessary. He said that most people just walk them through their house and point at stuff they want to take with them. But James is super efficient and now all our stuff is packed, ready for Seattle! I took this photo but James said that it made it look like we had a lot less stuff than we actually do. He said “this is just the tip of the iceberg” and took some more photos. You can see one half of our couch in the background and the other half in the foreground being packed by the guy in blue. In front of the couch is a chest of drawers and then an Ikea shelf. The other mover is pointing at the lamp. Apparently they had to cut the cable to get it to fit in the container and James is going to put it back together when we’re in Seattle. 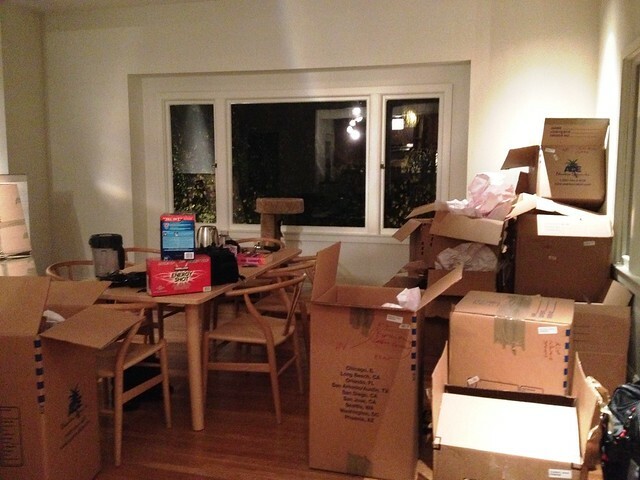 To the right were more boxes. On the window sill you can see the aerosols that we weren’t allowed to take. 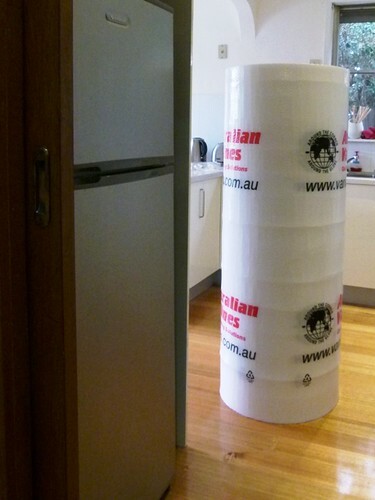 Everything was waterproofed and covered in what James described as “cushiony, plasticky paper”. This is the cushiony, plasticky paper. It was taller than me. 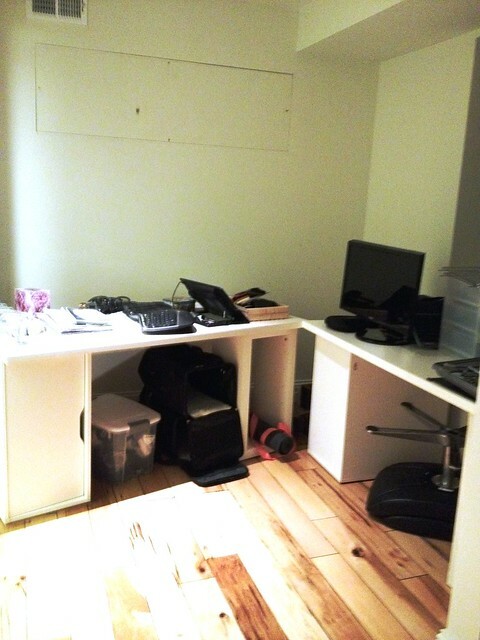 It looks like a lot of boxes, but apparently we packed a lot lighter than most people doing a corporate move. He did say that people paying for their own relocation tend to have less stuff. He also said he’s been doing a lot of packing recently for people moving from Melbourne to Seattle (for Microsoft though, not Amazon – I guess they also did a recruitment drive in Australia). Everything is insured – $45,000 for the sea shipment and $10,000 for the air. I have to say that I won’t be crying if it all gets lost! I’ve been posting even more infrequently than normal, but that’s because I’ve been sitting on some exciting news. As you can probably guess based on the title of this post, James has been offered a job with Amazon in Seattle. I had to hold off posting anything because James wanted to give notice to his boss before having the news out on the web. As with any small company, his leaving will create a hole that needs to be filled (and James is reasonably specialised so it might be a pain to replace him). But he has always wanted to work overseas, and he couldn’t turn down the opportunity to work on cutting edge stuff with some really smart people. James gets a salary (the same as he’s earning here, though cost of living is lower in Seattle and he pays about $20,000 less tax), a signing bonus, stock options, health care, and potentially a performance bonus. To claim all of his allotted stock James needs to stay at Amazon for at least 4 years. To claim his full signing bonus he needs to stay there for 2 years. What he’s hoping though, is that he enjoys it so much that he could see himself staying there in the medium to long term. It’s a bit scary leaving Australia – (almost) all of our friends are here, we love where we live, James has a secure, well-paying job with a great boss, and we have a really fantastic life. We’re leaving that to move to a country halfway across the world, to a state where we don’t know anyone. Plus I’m pretty iffy about the US economy and nervous at how rapidly Amazon has expanded. And what if he doesn’t like it? *bites nails* But I think if James hadn’t taken this opportunity he would always wonder what could have been. This is a big step for his career and we’re both really excited. James will be working in the Kindle group and starts work on May 28. Which doesn’t give us a lot of time to sell our apartment, the car, and various valuable household items. We’ve managed to give (or throw) away a bunch of stuff, and we are determined to never accumulate so many possessions again. We’re not bringing a lot of stuff over (even though Amazon pays for it all) but since furniture is cheaper in the US we’ll just re-buy nice versions of things we need – and since it will be forever furniture, we’ll pay to ship them to Australia when we return. Funnily enough, the one thing I can’t seem to find is a stylish couch set with storage underneath. We’re considering buying the Delta Storage from King Furniture and shipping that to the US. Our friends own it in aqua and it’s awesome. I am supremely jealous. It’s comfortable, attractive, and has enough storage underneath to fit a lot of stuff. I also like that you can join them together to form a bed, which will be handy if people come to visit us (please come to visit us).